If you follow me on either Facebook or Twitter, you might've seen me mention these already. I've always been a nail polish addict, but I think it got worse this year. There are just too many pretty shades and finishes that I want to try (glitter! matte! crackle! ), as well as some ambitious nail art. It's just a fun, small way to express yourself. With nail art, anything goes. It's also just too easy to spend money on. Nail polish can typically be anywhere from a couple of bucks to around $10, and is usually justifiable because hey, it's not that expensive (cut to my ever-growing collection of random polishes that have only been used a few times). 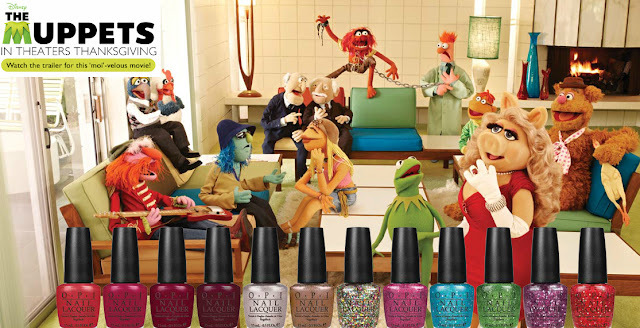 This collection is available in stores now, and I'm actually really impressed with the shades. The set is made up of really fun glitters (I'm coveting the magically colorful Rainbow Connection), as well as shimmery reds and nudes. It's a good mix. 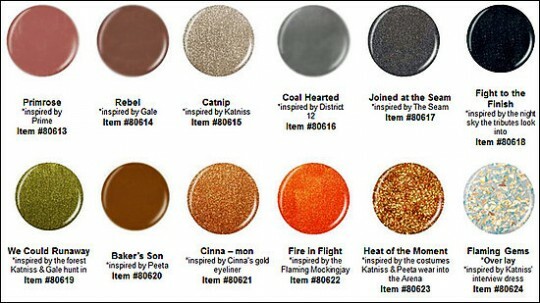 I'm not sure which shades I'd actually want to wear from this collection (some are a little...drab/sad), and the names are cheesy enough to induce secondhand embarrassment, but the sheer fact that it's inspired by Hunger Games--one of my favorite YA series--is enough to convince me to own a bottle or two. It's set to launch early next year. These movie-inspired collections always seem a little random, no? (Ahem. Pirates of the Caribbean. Shrek.) I'm still intrigued though.